Who are Barry and Sandra? 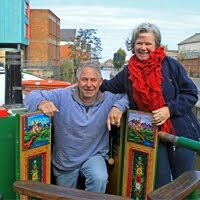 Welcome to our narrowboat adventure blog diary! 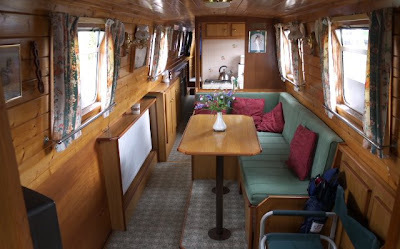 We will be keeping you all updated on our cruising around the canals of Britain over the coming 5-6 months. 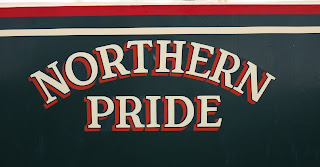 As most of you will be aware, we bought 'Northern Pride' on Friday 10 April, 6 days after arriving in England on 4 April. She is currently moored at a place called Barbridge, near Nantwich, and we hope to take possession and make it our new home on Sunday 19 April, should she pass her boat safety certificate on 18 April! If she doesn't then we may still take possession but be stuck in the mooring for a day (or few!) until any problems are sorted. Our first trip will be to the Llangollen canal, which I believe involves 15 locks to get to Whitchurch and the link to Lllangollen. Along this canal route there are 2 aquaducts, very beautiful, with huge drops down one side. Barry will be doing some of this route twice (but not the locks!) as I am away in Barcelona the weekend of 1 - 4 May (as an 'angel' on a hen weekend), so a family friend will be coming on board to keep him company. Tomorrow we hope the rain will go away and we will go to Kidderminster and travel on the Severn Valley Steam train to Bridgenorth. Then Sunday up to the boat to finally get some things unpacked and settle in. I'm the 1st silly blogger to join ! Must have to much time on my hands ! Barry, I'm keen to know what motor is in your boat. Can you let me know when you get a chance? Well the weather is picking up. Hope all goes well on Sunday. Hope your man cold is getting better Sandra! By now you will have set sail - (without the sail of course!!) Happy travelling. The dream is finally alive! !